Happy Bloggers Challenge Friday, I hope you had a Happy Thanksgiving! This week I gave the Bloggers Challenge Players the colors of Rust, Blue and Mustard to use with their creations. 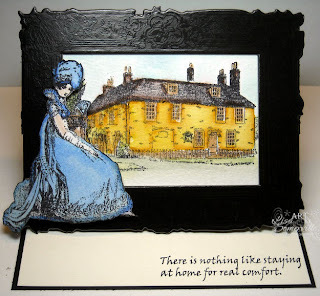 Here I've added some of the images from the latest release by Artistic Outpost - Jane's Countryside, to create an Easel card using a wonderful chipboard frame shape that my friend Sue had given me. I love going through my goodie bag of things and finding creative ways to use them. The images are stamped in Black Archival on Watercolor paper then colored using the Marker Watercoloring Technique. The house is matted behind the frame, Jane was cut out and added to the frame with dimensionals. The added sentiment is also from Jane's Countryside. Thanks for stopping by, I'm off to have a creative playdate with my friend Sue! For more inspiration using this weeks challenge colors, click on the Bloggers Challenge Logo on my sidebar. I don't know how you outdo yourself, but you did! The frame is spectacular and the coloring is outstanding!!! Love the house in yellow ... so beautiful. I pray that you had a wonderful Thanksgiving Holiday! What a great use of colors! This is so beautiful. I just love this set. I can't believe I have never read one of the books. I think after the holidays I will check them out, and just read all day! Did you ever think of melting those yummy chocolate coverd marshmallow pilgrim hats, and eating them on your keebler cookies? That is what firs places are for!!! Oh. My. Word! This is such a stunning card -- I love everything about it. Way too pretty to send to someone who wouldn't appreciate -- make certain your recipient is a stamper! Fantastic card. Love the images you used and how you used them. The easel card really shows them off with the gorgeous frame. That chipboard frame is absolutely amazing, your buddy is so nice to you :-) It turned out beautiful! I was really moved when I saw Artistic Outpost bring out these new images...of course I am a vintage nut and the Jane Austen movie was one of my favorites. Love the nostalgia - even tho some days even nostalgia isn't even like it used to be -- sigh. You did a beautiful job, Lisa. I really had to scratch my head for these colors, didn't come easy. Love yours!! Hugs, Gayle. Jane's house is stunning in the frame and the colors you used, luv it! I love looking at your artwork. Wow - this is so elegant. The black frame really makes this special. That frame is wonderful! Chipboard huh? Beautiful job on this it is a true work of art! This is definitely a WOW! Love the images you used....so regal. Great use of this week's color combo! Absolutely fabulous. Love your frame and the vintage images. Hope your Thanksgiving was truly wonderful. Simply beautiful, Lisa. The frame complements the image perfectly.